It’s here! I can finally reveal the cover for my final Shadow Falls book, Chosen at Nightfall. I’m so excited about it. too! I love the cover and think it fits the book perfectly. But then I have been fortunate enough to love all of my Shadow Falls covers. When I wrote Born at Midnight, my first Shadow Falls book, I had no idea how the cover would look. And I have to admit, I was a bit nervous. I think a book’s cover has a lot to do with whether or not people stop, pick it up and buy it or pass right on by. As it turned out, I was thrilled by the cover and received many great comments about it. And now I have this fabulous cover to be thankful for. 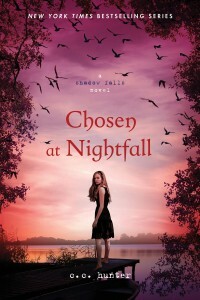 But before Chosen at Nightfall comes out in 2013, Whispers at Moonrise will be out October 2. I know I revealed this cover a while ago, but the closer it gets to the release date, the more excited I get. So, tell me, what are you looking forward to learning in Whispers at Moonrise? Will Kylie discover another power? Will Lucas’s pack try to break up Kylie and him? And what about Derek? Lots of questions, but you will have to wait to find out. But maybe not…read on. I have two giveaways today! 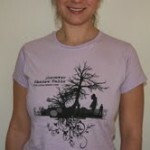 First, I am giving away a Shadow Falls t-shirt to one lucky winner who posts a comment. Those members of my Shadow Falls Street Team already have a t-shirt, but you could always win one for your friend. And especially for my non-Street Team members, I am giving away an advanced copy of Whispers at Moonrise! So be sure to leave a comment to win. Then you won’t have to wait until October to read it. Okay, I had a little time to ask Lucas and Derek a few more of your questions. So, here are their answers. You may be surprised by what they say. Derek: I could get along with him, but I’m not completely sure we could become friends. Or at least not close friends. It bothers me that he’s hurt Kylie. And yes, I know that I hurt her, too. And I’m angry at myself about that. I think that will always be one of my biggest regrets. Lucas: If Kylie wanted it, I’d try to do it, because I want her to be happy. But the truth is that while I’d try, I’m not sure Derek and I have enough in common to be friends. I mean, the thing we have in common mostly is Kylie, and that doesn’t bring us together, it actually does the opposite. Derek: Isn’t that answer evident? The only reason Kylie is with Lucas now is because I screwed up. I can read her emotions, I can feel what she feels. When she’s sad, I can make her happy. When she’s upset, I can help her cope. I love her and I accept her for whatever she is—unlike someone else. Isn’t that love? Wanting to be there to help the person you care about deal with the hard times in life. Accepting everything about the person. If Kylie will just give me a second chance, I’ll prove to her that we were meant to be. Lucas: Kylie and I have had a bond since we were six and seven-years-old. As crazy as it sounds, I think I knew she was the one for me even back then. She doesn’t know it yet, well, she does figure it out in Whispers at Moonrise, but she was my first kiss, my first love. I snuck into her bedroom window one night when she was sleeping and pressed my lips to her cheek. It was awesome and scary at the same time. I know Kylie and I have some things to work out. My pack and my family don’t think we’re a good match. But what the hell do that know? And soon, very soon, I can stop pretending with my dad and tell him that this is my life and I’m going to live it the way I want to. And that way will always include Kylie. So, who do you HONESTLY feel would be best for Kylie? Not necessarily who you think is hot (well they both are really! ), but who do you think would make her happiest? Today, I decided to post a personal experience piece I wrote years ago. Yes, in another life, I wrote nonfiction for all sorts of magazines. This story was the leading essay in the Chicken Soup for the Mother’s Soul 2 in 1995. Well several years back, I got a request from someone in Vietnam to use it to make a short video for a school project. The other night I was searching for something on You Tube and found it. I can’t understand a word of it, but it still brought tears to my eyes because I know the story. And it reminded me in a way of Kylie and Sara and the issues they have with their moms. So, I decided to post it today. I’ll be upfront with you, there are no vampires, werewolves or any supernaturals in this short piece. But there’s a lot of emotion, and I thought you might enjoy it. Next week, we’ll go back to answering some more questions you have for Lucas and Derek. 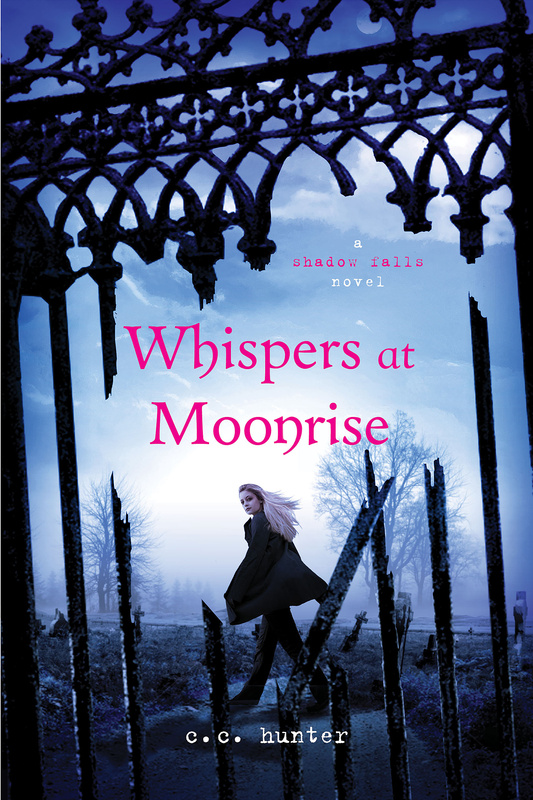 And hey…Whispers at Moonrise is getting closer to the release date!! We all know what it’s like to get that phone call in the middle of the night. This night’s call was no different. Jerking up to the ringing summons, I focused on the red illuminated numbers of my clock. Midnight. Was someone I loved in trouble? Panicky thoughts filled my sleep-dazed mind as I grabbed the receiver. My heart pounded, I gripped the phone tighter and eyed my husband, who was now turning to face my side of the bed. went to my daughter. When a desperate sound of the young crying voice became clearer on the line, I grabbed for my husband and squeezed his wrist. “No! Please let me finish! Please!” She pleaded, not so much in anger, but in desperation. seconds later with the portable phone held to his ear. I clutched the phone and stared at my husband, seeking guidance. “I’m here, I wouldn’t hang up,” I said. I swallowed the lump in my throat and stared at the how-to-talk-to-your-kids pamphlets scattered on my night stand. “I’m listening,” I whispered. beside me and laced his fingers through mine. I knew from his touch that he thought I was doing and saying the right thing. I listened to the silence in fear. When I didn’t hear her answer I bit into my lip and closed my eyes. Somehow I had to stop her from driving. But how? tension easing. She would get home. “I’m coming home, Mama.” There was a click, and the phone went silent. Moving from the bed, tears forming in my eyes, I walked out into the hall and went to stand in my sixteen-year-old daughter’s room. The dark silence hung thick. My husband came from behind, wrapped his arms around me, and rested his chin on the top of my head. I wiped the tears from my cheeks. “We have to learn to listen,” I said to him. He pulled me around to face him. “We’ll learn. You’ll see.” Then he took me into his arms, and I buried my head in his shoulder. number.” Somehow, I was sure this had been some kind of a wake call for me as a mother. “Mom, Dad, what are you doing?” The muffled young voice came from under the covers. I walked over to my daughter who now sat up staring into the darkness. “We’re practicing,” I answered her question. “Practicing what?” she mumbled and laid back on the mattress her eyes already closed in slumber. “Listening,” I whispered and brushed a hand over her cheek. Now that you’ve read the story, watch the video and let me know what you think. I loved all the great questions for Lucas and Derek. I’ll try to answer most of them over time. However, I’m nose deep in writing the Chosen at Nightfall. And I’ve gotten a rough draft of the cover. I love it! Anyway, for today’s blog I decided to answers one question. Derek: It was the first time I felt her. I was standing in the parking lot waiting for the bus to take us to Shadow Falls. I felt her. Her emotions were so pure, so heart-rendering, I wanted to help her so badly, it hurt. And then of course, I looked at her. It was over then, she had snatched my heart right out of my chest. And for the one word that would describe her? I’d have to say, it was breathtaking. Lucas: The first time I saw her. She was only six year olds. But she was precious. Hey…I was only seven, so she wasn’t too young for me. The way she smiled. The way her eyes lit up, it was magical. Then, I looked to see if she was all human and she wasn’t. I mean…I didn’t know what she was, but one word kept playing across my mind: Mine. I wanted her to be mine. I guess that’s the word I would describe her. Although, honestly, it would take more than one word to describe her. And now that I’ve answered these for Lucas and Derek, I want to ask you guys a question. What do you think you should feel when you first lay eyes on that special person? What thought goes through your mind. Maybe you’ve met that special person, or maybe it’s still a dream that will happen soon. For me when I first laid eyes on Mr. Craig. I thought, he’s cute, but I’m so not looking for a guy in my life. He had to convince me that while it might not be the right time, he was definitely the right person. And I’m so glad he convinced me! Oh…has everyone read the scenes from Lucas and Derek about the first seeing Kylie the first time at the camp? If not check it out: http://www.cchunterbooks.com/specialcontent.html. The winner of the Shadow Falls t-shirt from last week is Brooklyn. Please email me at cc@cchunterbooks.com with your mailing address and t-shirt size.